The rabbit-proof fence completed in 1907 was built to protect Western Australian crops and pasture lands from the destructive scourge of the rabbit. The number 1 Rabbit Proof fence was the longest line of unbroken fence in the world, stretching 1,139 miles. The fence represents a unique, if inadequate, response to an over whelming environmental problem. This is a recently completed piece made for Victorian Quilters challenge for 2013 which is currently travelling the country. The rabbit in the front is looking at us as if to say” I’m going over there and you can’t stop me”. 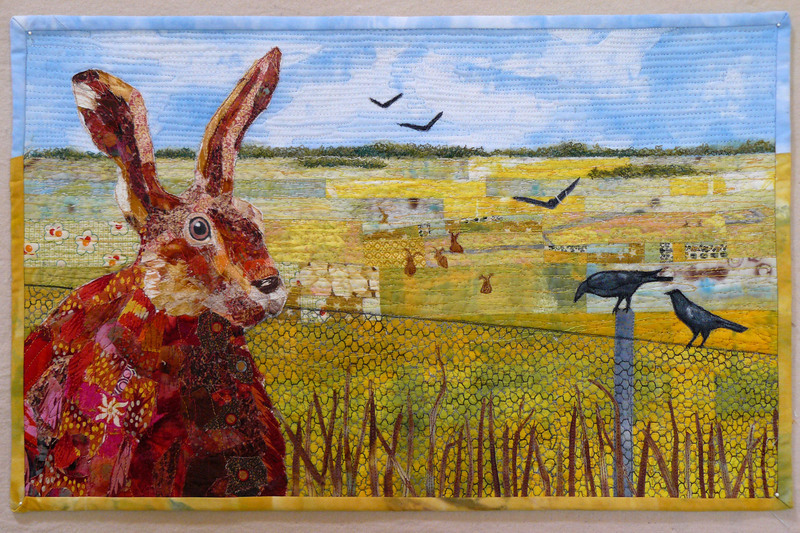 I have used tiny pieces of hand cut cotton fabric to build up a collage of the rabbit which were glued down and sewn over. The background is pieced with a mixture of commercial and hand dyed fabric. It was difficult to get the fence right. 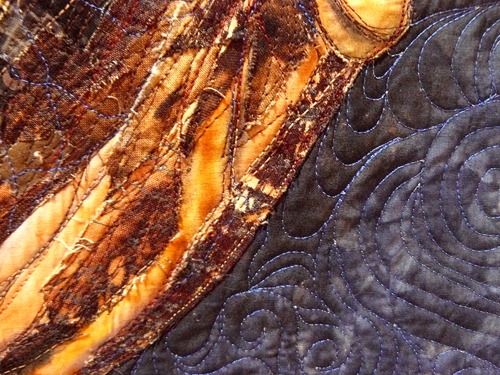 After some trial and error I ended up free-motion quilting the wire with a darkish grey thread. The crows were added to balance the design. You might notice the rabbits over the fence in the distance gallivanting in forbidden territory! My Mother-in-law grows these wonderful fruit from which we make jelly and paste. This is a piece I have done using a raw edge/confetti technique. 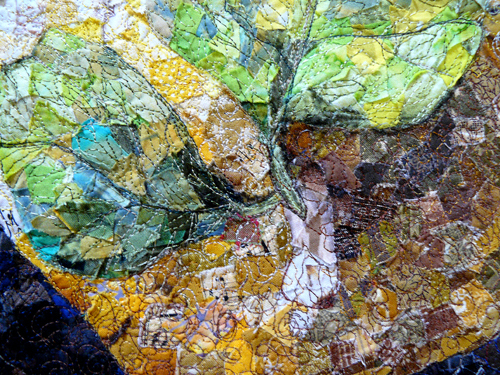 Each tiny little piece of fabric in the quinces and leaves were hand cut and glued on one piece at a time. 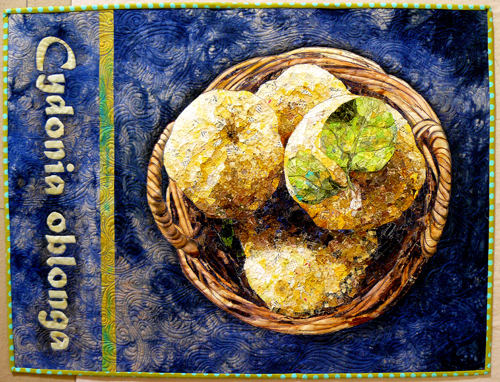 I tried to pay attention to the tones of the fabric to achieve the correct forms fo the fruit. The work was free-motion sketched in variegated threads. I was pleased to try out a quilting design called ‘McTavishing’. It was a great design to fill and improvise around elements. The botanical text was done using a freezer paper stencil and ‘Shiva sticks’. This work will be on display (and for sale) in the Nathalia Art Windows (The G.R.A.I.N store) from December 2013 to early Jan 2014.